Passion and excitement, as well as judgment and fear, characterize the current political environment in the United States. The recent election was the most surprising call for change in government in my lifetime, and it was also a call for meaningful culture change. Government agencies must prepare to accelerate improvements, but the current culture and leadership of these agencies will likely be the greatest barriers to success. It is not a time to boast, complain, or allow the latest headline to divide us; it is a time to do something serious, diligent and impactful. Unfortunately, survival has become the primary motivation as many government employees struggle with the current uncertain environment and prospect of major budget cuts. Many don’t realize culture and leadership are the keys to optimizing effectiveness in any agency, especially if resources are tight! Agency leaders must become educated about meaningful change and take action in collaboration with others to deliver results while constructively changing the culture of government. A recent poll by the America Psychological Association highlighted that 66 percent of Americans reported stress about the future of the country, 57 percent about the current political climate, and 49 percent about the election outcome. Trust in government is near an all-time low. Politicians or the press scream “culture crises” each year as some agencies have inexplicable problems we just don’t understand. 67% of Americans view big Government as a major threat and 2.75 million federal government employees are caught in the whirlwind of deeply ingrained cultural norms. Culture often rears its ugly head when organizations try to adapt to something new. Indeed, culture change is clearly needed to tackle present and future threats to national security like cyber-attacks and other forms of terrorism. And, it’s also needed to evolve essential government services that are clearly outdated but require substantial collaboration to change. Most importantly, culture change is needed to unleash the collective potential of our large government workforce and overcome insane behavior as we saw with the recent TSA whistleblower controversy. Congress may be outraged with every culture crises, but meaningful government culture change will likely need to start with agency leaders. Most agency leaders know their organization’s culture must change or evolve, but few understand how their own behavior is reinforcing the current culture. Some leaders actually want to learn how to engage their team in new ways to drive effectiveness. Unfortunately, most either don’t have the knowledge necessary to overcome the deeply entrenched culture or they remaining unwilling to take the first transparent and inclusive step. I spoke at a National Academy of Public Administration event in Washington DC on Changing the Culture of Government before the election last year. One attendee raised a question about the upcoming leadership transition. She wondered if it would be better to just wait until after a transition to begin any culture-related transformation efforts. I vehemently said “no” and recommended she start by understanding the current culture of her agency and the impact it was having, both positively and negatively, on their top mission priorities. We can always find reasons to delay or avoid transformation, especially if the infamous and often meaningless “culture” word enters the discussion. There are many reasons why the culture of government is not changing at a faster rate. It’s too easy to blame the President or Congress, but many reasons apply to agency leaders. The average federal executive maintains their position only two years and they often must deal with unique funding challenges. Agency leaders must have a sense of urgency and incredible tenacity to overcome common government challenges. They must also overcome the headwinds of a deeply entrenched culture that is evolving at a slow rate due to many reasons that apply to nearly all agencies. Lack of connecting culture change to mission priorities. So how do new cultural attributes form? They may eventually emerge from mandates and top-down jolts to the entire organization. Some fear this with the new administration and think the worst about how a Trump “Culture of Fear” might impact them. The goal needs to be change that is collective and constructive, and focused on the mission priorities of the agency. Enormous energy is consumed debating major policy changes instead of finding common ground and improving results with agency priority goals (think improving VA service, reforming the DoD acquisition process and eliminating waste, combating cyber threats, or enhancing public safety through police reforms). Initial results will precede the culture change. 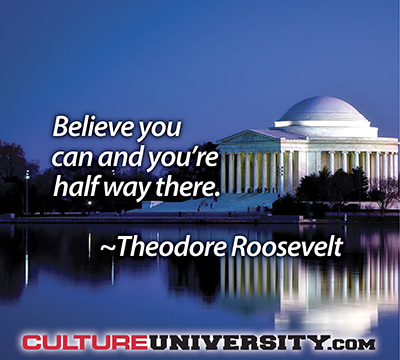 This valuable insight runs counter to arguments from some leaders that think they don’t have time for culture change. They claim they need immediate improvement and culture change takes a long time. Focusing the work on a top mission or performance priority with a targeted culture shift in mind will increase the likelihood of delivering meaningful results. I heard a great example from the new Veterans Affairs Secretary, David Shulkin. An interviewer confronted him with the fact that the high-profile measure of wait times at VA hospitals had not improved over the past couple of years. He shared the important point that the initial focus was on improving wait times for urgent care and they have improved dramatically. Unfortunately, he went on to talk about what he needed from Congress for continuous improvement without sharing more about what his organization learned from that improvement journey. There must be a strong learning focus on collectively evaluating the urgent care improvements. They should clearly identify what worked and what didn’t with engaging team members in this critical priority and intentionally apply these learnings to other major problems or goals. This type of intentional, agency-wide, learning focus is absent in most parts of government. Top leaders don’t understand the subject of culture or have a common language or measurement to deal with it effectively. Leaders may launch change efforts proactively with great intent, but they are chewed up by the current culture. The word “culture” has nearly lost its meaning. It’s important to be clear and specific about which norms and behaviors must change. Defining a common language is critical. It’s possible to measure some aspects of the underlying culture, but very few agencies have taken the step to measure specific cultural norms. These deeply entrenched expectations or “unwritten rules” drive the vast majority of behavior in organizations. A Cross-Agency Goal for People and Culture exists, and the supporting work is, unfortunately, focused on engagement, leadership, and hiring. While these are important areas to examine, the core of meaningful culture work includes involving groups in tackling significant agency priorities in culturally intelligent ways necessary to overcome major challenges. Individuals are engaged in the journey, learn together what works, and naturally apply it to other priorities and plans. Change efforts are focused on the work climate without understanding the underlying cultural drivers. The Federal Employee Viewpoint Survey (FEVS) has shown little change in the overall state of government employee engagement. The response rate in 2016 was a dismal 45%. There was a 1% engagement improvement over 2015, but the poor response rate speaks volumes about the real state of engagement. Government employees bombarded by existing cultural norms will not change their behavior with typical “action planning” efforts focused on individual engagement elements. Edgar Schein once said that cultural rules drive 90% of our behavior in organizations. The basic language of Constructive, Aggressive-Defensive, and Passive-Defensive expectations or norms from Human Synergistics helps me deal with client challenges every day. Passive/Defensive expectations exist in organizations, and these expectations such as not “rocking the boat,” making a good impression, asking everybody what they think before acting, and doing things for the approval of others often undermine effectiveness. Aggressive/Defensive expectations also exist in organizations and these expectations, such as maintaining unquestioned authority, outperforming peers, never making a mistake, opposing things indirectly, and many others don’t lead to sustainable effectiveness. Constructive expectations such as taking on challenging tasks, treating people as more important than things, and resolving conflicts constructively lead to sustainable effectiveness for individuals, teams, and the overall organization. It’s critical to move beyond the behavior we see in the climate and understand the underlying culture. Leaders need to precisely understand how both the climate and culture are impacting their work on top mission or performance priorities. The “key learnings” that leaders gain from this understanding are invaluable. “Alignment” efforts abound but have limited impact on the underlying culture. You’ve heard it. Define your values and align everything around them. Alignment work is typically involved in some form with culture transformation, but the focus should be on engaging groups in meaningful improvements that directly support the mission and performance priorities of the organization. Alignment efforts can easily be used to scale command and control efforts instead of building a more inclusive and collective approach to change. Uber is a recent, sad example with reports of sexism and other totally unacceptable behavior from this “high-performing” company. Team members may be highly engaged and committed to the purpose of Uber, but aspects of the underlying culture are toxic. Change efforts are disconnected within agencies and across agencies. Silo behavior abounds, and it’s encouraged by our structure of government. Outside of government, organizations are replacing traditional department structures with cross-functional structures or at least matrix structures that support collaboration. The cultural headwinds are enormous so it’s easier to focus on changes a department or team can control than to raise the bar and go after major cross-agency change efforts. Some government leaders focus on protecting resources and priorities managed within their work team instead of collaborating with others on important cross-functional improvements. The Government Accountability Office defined Best Practices and Leading Practices in Collaboration. Culture is referenced in the content, but the “best practices” only apply to the work climate. Some initial momentum may be gained through these improvements, but many change efforts will bog down as the current government culture frustrates change agents. And…most of all: Top leaders are not courageous enough to ignore current government leader norms and tenaciously, vulnerably, and collectively orchestrate sustainable change. Government leaders are “expected” to have the answers, play political games, and mandate change. It’s time to give those expectations the boot. It’s time to be curious, listen, learn, and courageously translate new knowledge to collective action. 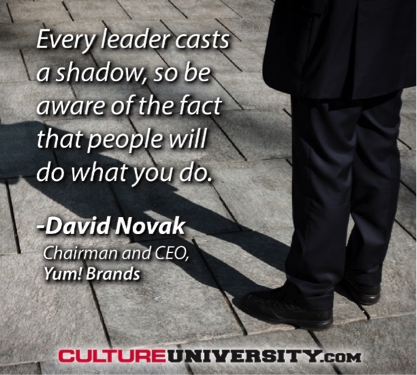 The “shadow of a leader” is powerful. Leaders must go first by exhibiting targeted behaviors and modeling the way with new approaches to manage meaningful mission-focused improvements. Critical insights from the top culture experts in history are, unfortunately, “secrets” to the vast majority of agency leaders. At the same time, other agency leaders turn away from the fundamentals of culture toward superficial solutions. It is possible to transform change efforts as leaders begin to understand the subject of culture. So how do you manage this challenging journey? There are four phases of improvement that will help agency leaders (and other leaders) with this journey. Focus on a top mission priority instead of trying to change culture directly: Zeroing in on a mission or performance priority and engaging the broader organization more extensively in this one critical area is key to delivering results. Renowned culture expert, Edgar Schein, says: “culture is built through shared learning and mutual experience.” Engage your organization or team to a much greater degree on a top mission priority to drive the shared learning, mutual experience, and results faster than general culture work. Priorities related to customer satisfaction, primary system or technology changes, quality, safety, or other measures of effectiveness work well. Go beyond engagement and understand the broader work climate and underlying culture: Define a language and measurement for the culture. A recent study by Deloitte highlighted that only 12% of leaders truly understand their culture. Many leaders think they are getting at culture through engagement efforts or other “culture” surveys when they are merely gaining an understanding of the work climate. They capture attitudes and perceptions about the work climate and completely miss powerful underlying norms or expectations. Integrate qualitative and quantitative methods to understand the culture and climate: It’s imperative to utilize qualitative approaches like interviews, focus groups, or other methods to understand how the culture and climate are specifically impacting results. The stories, examples, and related culture challenges are not hard to find. Edgar Schein also identified that effective culture change analysis requires “both a qualitative and quantitative approach.” The quantitative side helps with engaging large groups and bringing both a common language and research-based measurement of some cultural attributes to change efforts. Capture “key learnings” about the culture and climate: True cultural analysis that surfaces the data, stories, and examples of why cultural norms exist and how they are impacting results is a very enlightening experience. It will lead to far greater clarity about cultural strengths and weaknesses as team members acknowledge, “that’s us.” It should also lead to some significant “aha’s” about sub-culture differences, the power of norms, and underlying shared beliefs and assumptions that cause those norms to be deeply entrenched. One recent agency we worked with was struggling with collaboration and meeting new demands with current resources. Most team members were not involved in defining key strategies or supporting plans; they didn’t even know how those priorities and plans were established. They were “happy” with work in their small group or area and genuinely feared and believed sharing problems or improvement ideas would open their job up to analysis from others that might make things worse. Leadership must actively improve involvement and reduce fear through positive action based on team input. They need to show that sharing problems and improvement ideas will lead to results that support the mission of the agency to overcome the deeply entrenched fear, uncertainty, and hesitation. Clarify the improvement vision for the mission priority you select: This is not a vision statement. It is a clear explanation about why the agency mission or purpose will be supported through improvement in the strategic priority or objective selected. It should also highlight why culture is currently a challenge and an opportunity to shift or evolve as the organization learns new ways to support the mission priority. The commitment of the leader and leadership team needs to be clear along with their promise to role model behaviors that support the culture shift. Define a draft “FROM-TO shift” from defensive to constructive expectations: Most agencies have defined values and expected behaviors (the “TO”) but many have no language for the “FROM” side of their desperately needed culture shift. The defensive expectations I previously mentioned, both passive and aggressive, are the most critical part of understanding the “FROM” side of this concept. We need to understand these norms as a foundation for understanding beliefs, assumptions, mindsets, and other factors that help to explain why they exist. Some leaders consistently misdiagnose their culture problems and jump to conclusions without gaining any deeper cultural insight. Take the example of a government top leader that thinks there is a significant accountability or ownership problem in their agency. The actual cultural issue could be driven by perfectionistic, approval, avoidant, oppositional, or other norms in the current culture that current leadership, including the top leader, is perpetuating in many ways. Focusing on the “TO” behaviors we want does not address the root cause of the problems with the behavior we see on the surface. Identify the underlying beliefs or assumptions reinforcing the “FROM” norms or expectations: Culture analysis for some common government norms might involve understanding why new ideas aren’t being surfaced that challenge the status quo or why team members don’t feel they can translate any idea to action without approval. General feedback may be useful, but targeted feedback in connection to work on a particular mission priority is what’s needed to overcome generalizations and identify specific opportunities for change. Culture is a deep and complex topic, but feedback can be targeted and precise if it’s focused on a mission priority that provides a common cultural context. Define an approach to repeatedly engage agency team members in improving results with the mission priority and supporting the FROM-TO cultural shift. One-time engagement efforts are of little use for meaningful culture change. It may start with group engagement efforts to share the results of a cultural analysis and to prioritize improvements for a particular mission priority but this is just a start. The key is measuring progress and re-engaging groups at defined periods to drive shared learning, mutual experience, and results (see phase 3 below). Plans must not be finalized at the top and “rolled out” across the agency. The focus at the top is on confirming the mission priority, completing the culture analysis, and defining the approach for engaging the agency in new ways to collectively develop improvement plans. It’s difficult to manage this work in a comprehensive and inclusive way for every mission priority, so that’s why selecting a primary mission priority or goal is critical to building positive momentum and delivering meaningful results. Phase 3: Engage all team members in finalizing improvement plans for the mission priority. Refining the improvement vision for the mission priority: review the draft vision and obtain prioritized feedback, through voting or debate, about how to improve the vision before agency-wide communication. Refining the FROM-TO shift: review the culture analysis and draft FROM-TO shift defined by leadership. Obtain prioritized feedback for improvement about how to specifically refine the language of the FROM-TO shift. Identifying changes to mission priority goals/plans: obtain prioritized feedback about how to improve goals or plans for the mission priority while facilitating the FROM-TO shift. Hold the initial engagement session(s) and capture prioritized feedback: Facilitate the engagement session(s) with a high level of transparency and encourage open feedback. It’s useful to obtain prioritized feedback in breakout groups. Share the top 1-2 ideas from each group as an input to an overall vote or discussion on the top ideas for improvement. It may be useful to utilize an outside resource to support the design and facilitation of the engagement session. There may be some hesitation during initial engagement efforts, but trust will grow if initial employee involvement and feedback leads to positive change. I have witnessed the positive impact of the “Building Culture Muscle” cycle below in numerous organizations as leaders intentionally and repeatedly connect team members to improvement priorities and plans. Identify how the broader agency population will be engaged in the improvement process: The outcomes of the culture analysis and initial engagement session should be shared with all agency members. Additional engagement sessions will likely be needed to obtain prioritized feedback in supporting areas of the mission priority that apply to various sub-groups or teams. Many organizations start by engaging 1-2 levels below the leadership team managing the improvement approach. Others target engagement of all team members in some form from the very start. Commit to change in the areas prioritized by the group and re-engagement of the group to review progress: I facilitated well over 150+ of these group engagement sessions as a senior leader and consultant. My top learnings came when I was in a leadership role. I always entered these meetings with my impression about expected outcomes. To my surprise, the prioritized feedback from every group led to substantial new or refined improvements far beyond what I expected. Each one of these 150+ meetings ended with a commitment to implement significant improvements identified by the group and to re-engage them in 3-9 months to provide prioritized feedback on what was working and what didn’t live up to their expectations. This framework guaranteed a basic level of shared learning and mutual experience that united the team in support of a top mission priority. It’s critical to adjust management, communication, and motivation systems/habits to translate plans into effective action and shift the agency operating model. The problem in most agencies is not identifying improvements that will have a positive impact on culture but implementing them with sufficient energy, momentum, and results. I am sure we all can relate to Edgar Schein’s point that you only begin to truly understand a culture when you try to change it. It’s far easier to engage leadership and the broader organization in defining improvement plans than implementing them. Management systems – especially the basic habits for senior leadership to define, monitor, and manage mission priorities, measures, and improvement plans. Use standard agendas, check-in on FROM-TO feedback, monitor status of top objectives, and plan consistent communication activities. Communication systems – especially implementing or improving the formal and informal habits for communicating the status of priorities and plans along with obtaining regular, bottom-up feedback for improvement. Motivation systems – especially deliberate efforts to dramatically increase the recognition of team members that display the targeted constructive “TO” behavior in the FROM-TO shift and achieve results. Share stories about positive results enabled by the “TO” behaviors so others learn from the examples. One of the bottom 10 item scores from FEVS was: “creativity and innovation are rewarded.” Culture change doesn’t happen at the same pace across all teams. Openly recognize behavior and results with the courageous change agents or the constructive behavior will not spread. The lack of rigor in these three areas dramatically amplifies culture-related problems, and substantial adjustments are nearly always a part of significant transformation efforts. Top leaders must gain an understanding of how their behavior is impacting the behavior of others. Is that “impact” constructive, passive or aggressive? How are they reinforcing the current culture? My favorite questions in initial leadership interviews are: 1) Why is this change effort important to you personally? 2) How are you reinforcing the current culture and contributing to the culture frustrations that persist? The answers to these questions may lead to important leadership “ahas,” as culture expert Larry Senn calls them, or reveal how difficult the journey will be to uncover those ahas. If agency leaders believe the most significant change must start deep in their organization, they are sorely mistaken. Agency leaders waste tremendous energy on change efforts deep in their organization that don't deliver expected results due to the same bureaucratic top leadership approach. The shadow of a leader is very powerful. Larry Senn also said, “culture transformation starts with personal transformation.” If there’s no ahas with senior leadership that lead to a more inclusive improvement approach, then there will be no culture change. Culture change is a long-term journey comprised of a series of sprints. Manage these four phases of improvement, learn from what works and, especially, what doesn’t; apply this knowledge to the next stage of improvement. I found the easy part is the first significant series of engagement or feedback sessions. The hard part is managing enough change so there is absolutely no doubt there will be substantial positive feedback in the second series of engagement sessions (typically six to nine months after the first). I would facilitate change efforts like my life depended on them. I knew momentum with the broader team would never take hold if they didn’t acknowledge significant initial progress within a maximum of six to nine months. The culture does not change during this period, but behavior must undoubtedly evolve and lead to results. Culture change is not about making everyone happy; it’s about results and shared learning. There must be some results with leading indicators for the mission priority, or the change journey could be over. Team members will believe this “new” approach is just another pointless agency change effort if they don’t see substantial progress. The basic four-phase framework in this post is loaded with common sense but rarely managed with intention. Commit to the long-term culture journey and consistent work across the organization, team, and individual levels or don’t start at all. I have witnessed a major shift in organizations that are truly committing to meaningful culture change. They may be in the minority, especially in government, but some are getting far more strategic about their approach. They are clearly defining an initial phase of improvement, and they are looking ahead as they determine the next logical phase of change to support their strategy. Some explicitly budget for expanding their approach because they know shared learning and connecting the work across individuals, teams, and the organization must be led with consistency. Results are clearly achieved with each phase of improvement in their long-term journey. The majority of agencies start their culture journey with skepticism and a lack of leadership from the top. This too must change because it’s not worth starting the journey if there isn’t a strong commitment from leadership. These insights are only a small part of what’s necessary for meaningful culture change and sustainable results. They help to build initial momentum and results required for any new cultural attribute to emerge. We need a step-change in the level of culturally intelligent approaches to overcome deeply entrenched cultural norms. Jeffrey David Cox, national president of the American Federation of Government Employees, said, “Federal employees get up and go to work and they do what they are told to do.” This outdated expectation and others must shift to unleash the knowledge and skill necessary to change the culture of government. What about the President (top leader)? Some of you might be thinking this post is about sub-culture change and not changing the entire culture of government. You are correct. There is no "one culture" in an organization; sub-culture differences exist, and work should be customized to fit with priorities and plans for individual teams. The top leader always has tremendous influence with culture change and must eventually be engaged in the process. I believe we need far more examples of constructive culture change across many different agencies for a visionary President to bring it all together. The President is a product of the current culture of government. An "outsider" like President Trump is still a product of the larger management culture in the United States. Culturally intelligent approaches like those advocated in this post are not the norm in either macroculture. We need far more examples of inclusive and collaborative approaches to solve some of our most difficult challenges. We have a history of collectively overcoming major problems, but we have strayed from the bedrock values and principles that make America great. We need more culturally intelligent leaders in government. What culture insights can you add to help agency leaders make a meaningful difference? Need some help getting started with culture and performance improvement? 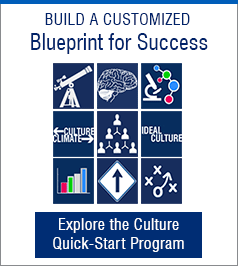 Learn about the 90-Day Culture and Performance Quick-Start Program. The descriptions of the cultural styles and norms are from the Organizational Culture Inventory® by R. A. Cooke and J. C. Lafferty.